Before a play hits the stage, it goes through several other stages. The first is the opposite of public performance – the writing, solo and in private. 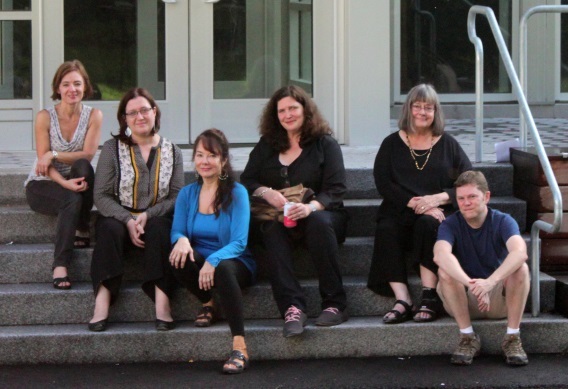 Then, for the members of the Northampton Playwrights Lab, it’s shared with a small circle of fellow dramatists, who offer insights and suggestions to the work in progress. Then, usually after several revisions and further feedback, it’s put on its feet for the first time in a reading. This weekend and next, seven scripts developed in the Lab will be shared with the Valley’s community of theatergoers and -makers in rehearsed, semi-staged readings, under the collective title Play by Play. Together, they constitute the inaugural performance at another work in progress, the FlexSpace Theatre of the Northampton Arts Trust Building. The festival is produced by Nikki Beck and performed by a virtual Who’s Who of Valley talent. Also coincidental, and perhaps surprising, is the fact that three of the plays, from this all-white group of authors, include black characters – and all three are in the festival’s first weekend. In the FlexSpace Theatre, Northampton Community Arts Trust Building, 33 Hawley Street, Northampton.